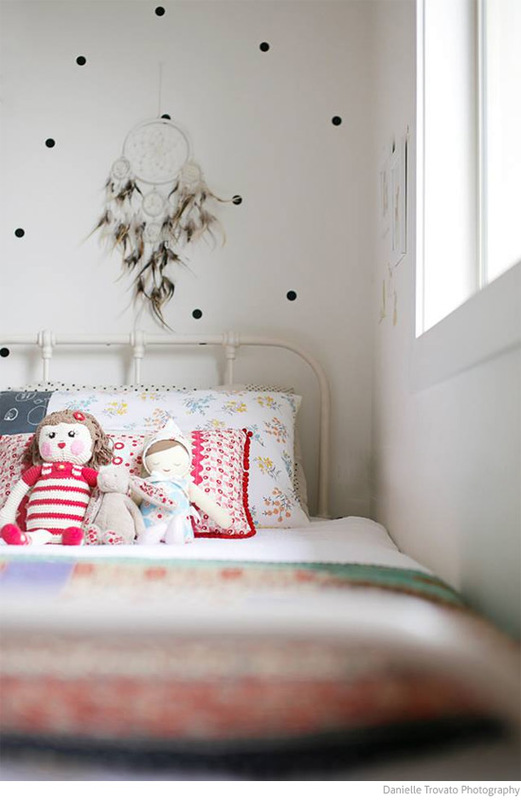 Welcome to 3-year-old Maisyn's lovely bedroom. 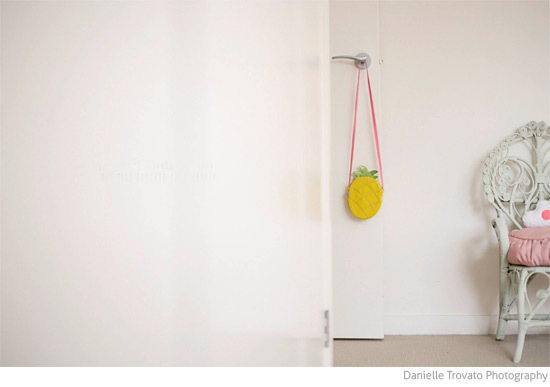 These gorgeous photos are by one of my favourite child portrait and kids' interior photographers - Danielle Trovato Photography. Maisyn's Mum is the clever Samantha Mungean of Maisy Dee - an online store stocking handmade essentials for babies and kids. Many of the pieces that you will find below are recycled and renovated, or made by Sam. 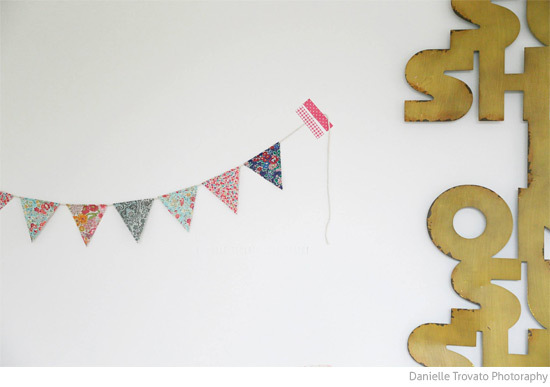 Read on to find out more about this special room that will grow with cutie Maisyn. 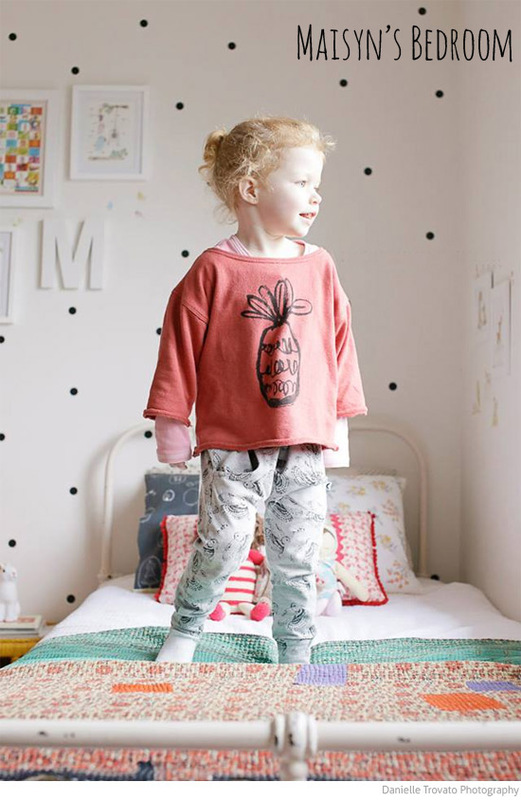 The neutral-coloured walls and floor make a great canvas for the lovely muted colour palette in Maisyn's room. Choosing black polks dots was so clever - they pick up the legs of the Acapulco chair and help the room feel modern, without competing with the artworks and colour. I'm in love with the stacked bookshelf - look at those legs! Who doesn't love a touch of pineapple! Note that the cane peacock chair mirrors the shapes in the yellow cane bedside table. Child's peacock chair: Salvation Army Stores bargain for $12! 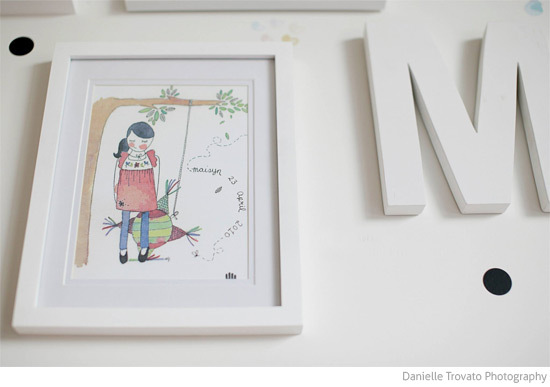 What a gorgeous alternative to a traditional birth announcement. 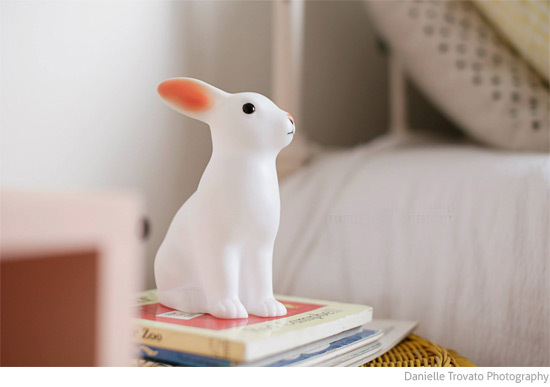 This little bunny is now a kids' room classic. They are so affordable and utterly cute. 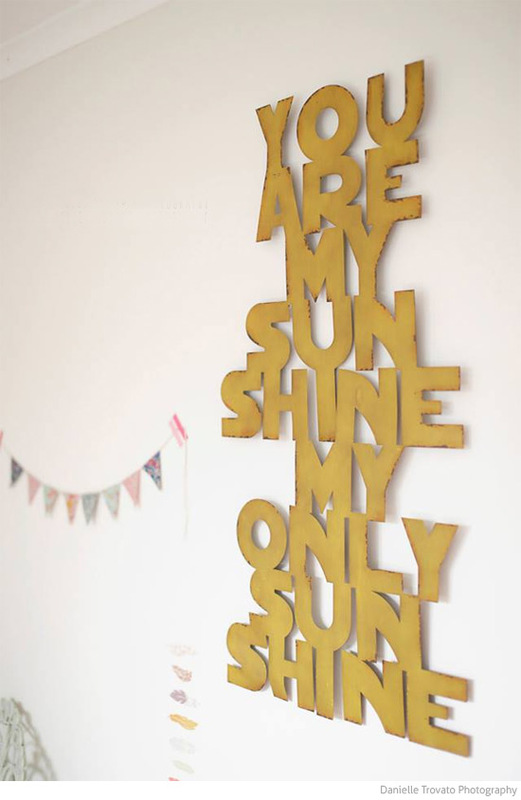 My favourite baby shower gift to give! Thank you so much Samantha for sharing your daughter's room with us. 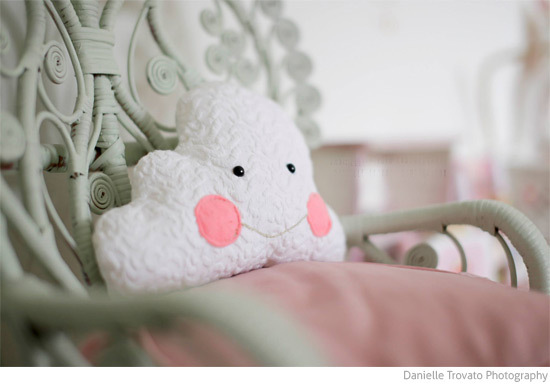 If you like Samantha's style, stay tuned for her son's bedrooms which I will share with you over the coming months. 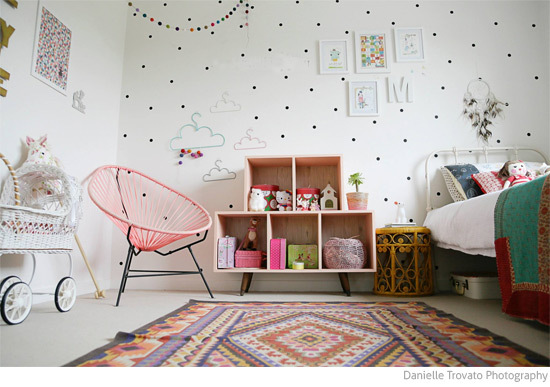 Oh, what a lovely room and lovelier little girl! I especially like the rabbit lamp. 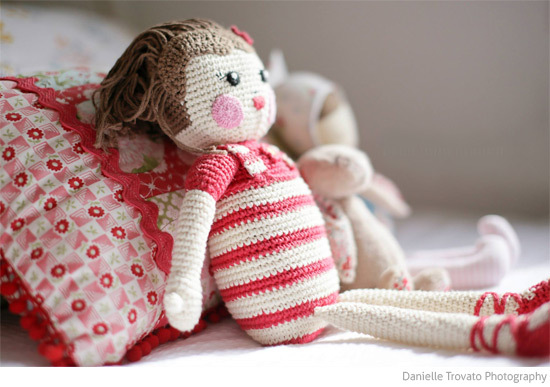 I've been meaning to get started on knitting my daughter a doll for a while, and this inspires me to do so. Gorgeous room. 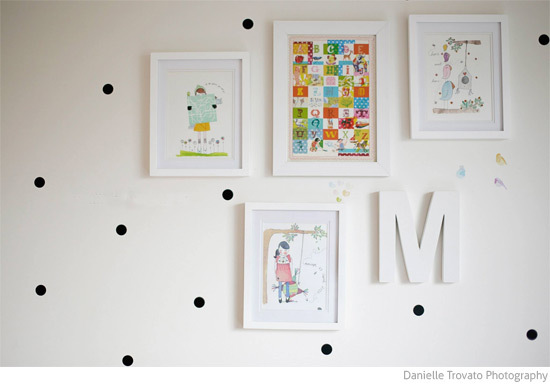 Just wondering what size wall dots have been used.